Last July 3, I finally made my first ice cream at home! I have no ice cream maker, no eggs needed, and no professional mixer required either. With just three ingredients, I was able to re-create this homemade ice cream recipe from Anchor Home Chef winner Michiko Halili. It was a success! After tasting this coffee-flavored ice cream during the Anchor Home Chef finals night I featured last month, I was dead set on trying it at home. The short list of ingredients and simple instructions were very encouraging. 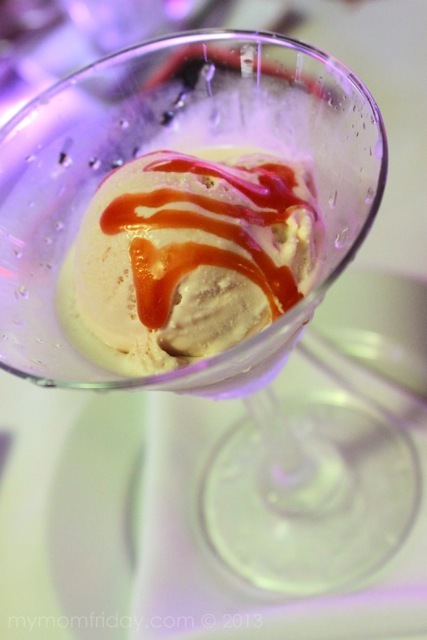 I posted all the dishes in my Anchor post, including this Caramel Macchiato Ice Cream recipe here. 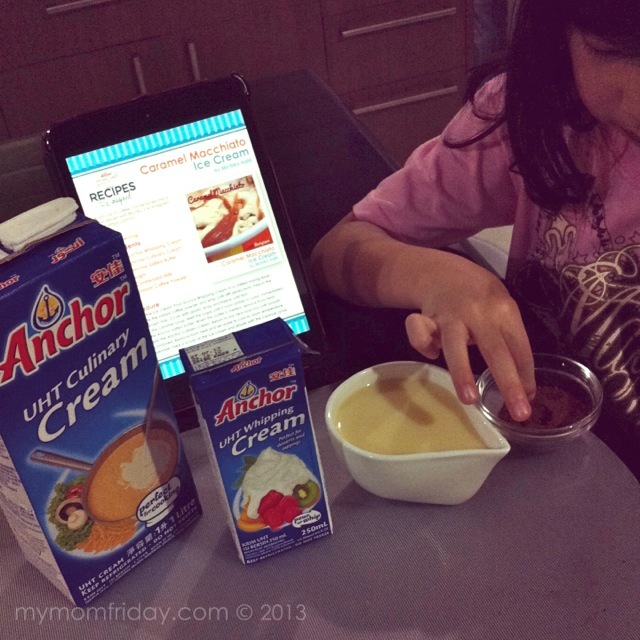 The girl was more excited than I am since she was asking to make the ice cream much earlier, but I was not able to buy the Anchor Culinary Cream for the caramel yet. 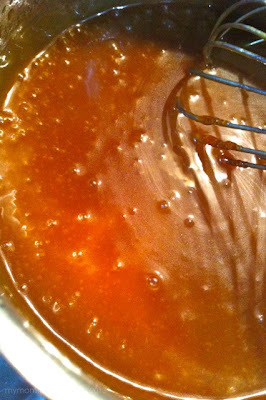 As soon as I completed the ingredients - 3 for the ice cream, and 3 for the caramel sauce (how cool is that?! ), we scheduled our kitchen date one afternoon and made our first coffee ice cream. I used a hand mixer to whip the coffee, whipping cream, and condensed milk. I only had coffee granules at that time, so we took out our mortar and pestle and the girl pounded away until we got our powdered coffee. As I was taking a shot from my phone, she pulled a fast one on me and dipped her finger to taste! Approved! Time to cover this bowl and left it overnight to freeze. 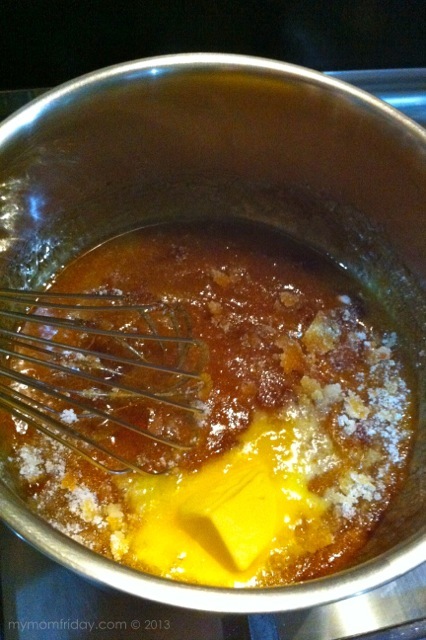 Meanwhile, I heated the sugar and butter to make the caramel sauce. The recipe did not call for vanilla, but I added 1/4 teaspoon vanilla extract for a warm aromatic flavor before mixing in the cream. Rich, thick, sinful caramel! Presenting - our first homemade ice cream! 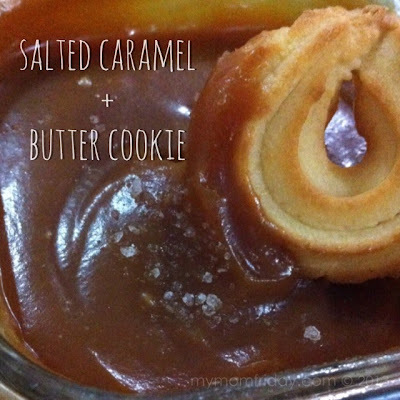 It's really creamy and flavorful, even without the caramel. Thanks to Michiko for creating this easy-to-do recipe. Click on the photo to watch the 15-second video I posted on Instagram. 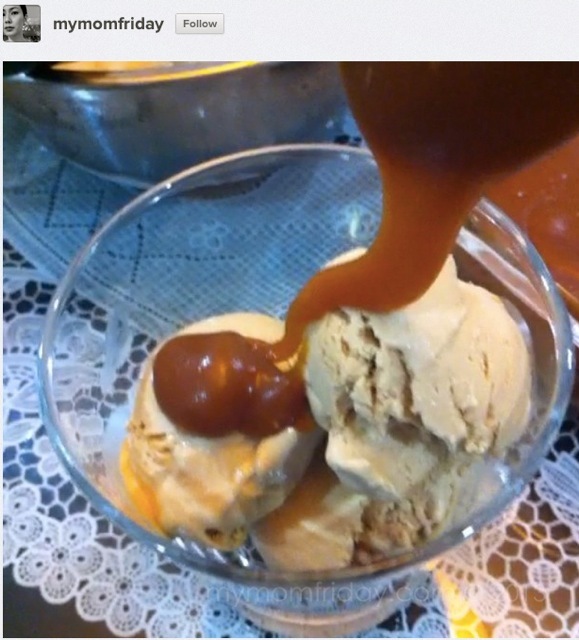 With the recipe, I made over a quart of ice cream, and over a cup of caramel sauce. Lots of leftover caramel, so one time, I sprinkled sea salt and dipped some cookies. Heaven! Go try this at home! 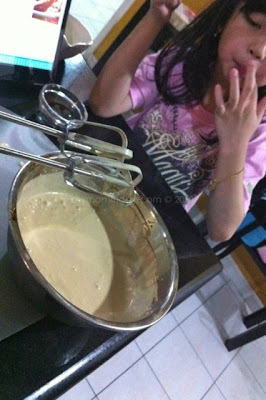 Even kids can do this (with some assistance using the mixer). Since we already have the base ice cream recipe, we can experiment with other flavors next time. I'm thinking cookie butter ice cream!